The recently introduced Miracle Worker Cruisers offer some interesting build alternatives. Sadly, the cruisers aren’t available on sto-academy.com yet, so screenshots will do at the moment. So please consider this page as work in progress. We highly recommend the tactical versions as the current meta favors tactical consoles to boost you weapon damage. 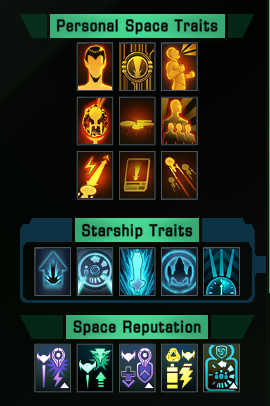 It also offers the best starship trait from the bundle. This is a common beam build. Nothing special and more important slightly worse than i.e. 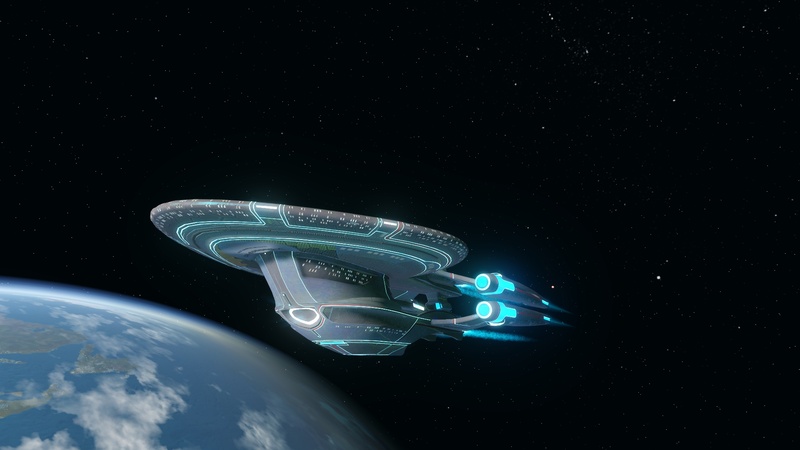 the T6 flagship series which clearly offer the better console set. The Nausicaan three piece set is really made for this ship. A 5/3 weapon layout similar to the Sheshar would be perfect (see that build here), but 4/4 is still ok.
You should use different kind of disruptors (crafted, coalition). 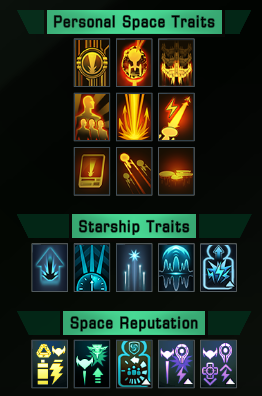 And drop that critical systems starship trait in favor of Invincible if you need to. Or Supremacy, ofc. I used this build on my Reman engineer to get 259k. It’s a build tailored for fast split runs that last up to 70 seconds but lacks the necessary cooldown reduction abilites. So eventually it will run out of steam in longer encounters. Engineers don’t need energy nodes, you may drop them. Shield regeneration is quite good, one point isn’t wasted there. 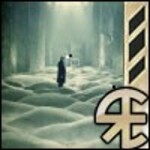 Improved drain expertise is used for the Quantum Set. A couple of quick questions about the split record build. 1. It looks like all BOs have superior infiltrators. Is this correct? 2. What engineering BO has both infiltrator and romulan operative traits? Forgot one question. Are you still using Intel Strategist as specializations for the build? Miracle Worker / Strategist for split runs. Intel / Strategist for everything else. Afaik there is no engineer with both infiltrator and operative available in game atm. While the superior operative trait stacks, same levels of infiltrator do not. So it’s 10s from the Reman, 7.5s from captain and 5s from ambush for a total of 22.5s. I cloak 2 times for ~2.6s in a run to cover almost all of the combat time (-5s while cloaked ofc.). Thanks. 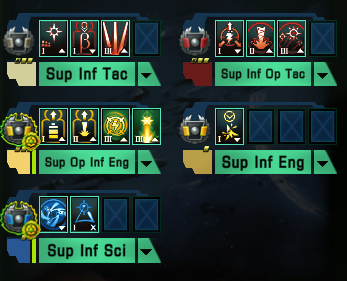 I didn’t realize that the Captain Infiltrator stacked with the BO Infiltrator trait, although I was aware only the largest BO infiltrator bonus was counted. Now I know. Why not take one point from shields and put it in scientific readiness? However Timeline stabilizer consoles can reduce recharge time of science boff skills by 15% (equivalent to +85 Scientific Readiness skillpoint). Thus that skilltree does not put one point in scientific readiness skill. I use the vortex once for the spheres and FBP once or twice. Temporal Negotiator is all I need. I have one toon with an engineering based skill tree and light on tac skill points. Would I get better dps results with 3 points in energy damage and one in hull pen or 3 in hull pen and one in energy damage? How do you manage the CD’s in this build? I often wonder about that when seeing other peoples builds. With only the skills + space trait there’s quite a bit missing for the global CD on most skills. Isn’t that that a rather big loss in sustained damage and would negate the usefulness of the new FAW Trait that adds 5 seconds duration for example? Tactical Initiative can be used on other players. Also a healthy dose of Focused Frenzy works wonders if timed right. Thanks I totally was at my Eng thinking about CD reductions. I forgot about TI 🙂 . I see what you mean. With the right timing you can go for quite a bit on that setup. What set visual is that on the Miracle Worker ship in the top photo? Kinda looks like Aegis but brighter. 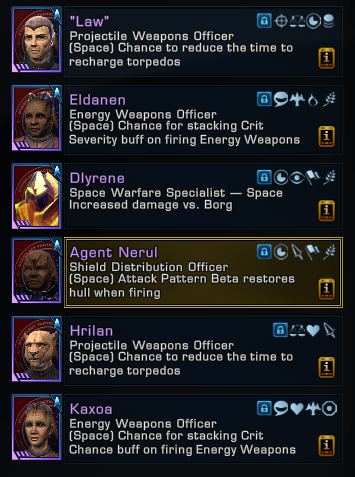 It’s the shield from the Lukari reputation. 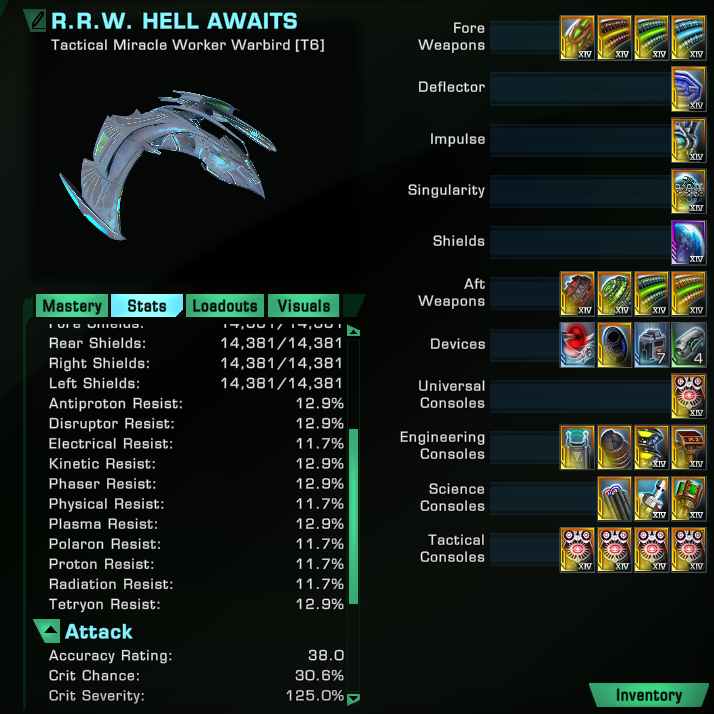 Hellspawny, can you post a link to the Tactical Miracle Worker Entoiled Technology build. I’d like to read more on it. Will do, when back from work. Clicked it together in a hurry. will validate it tomorrow. 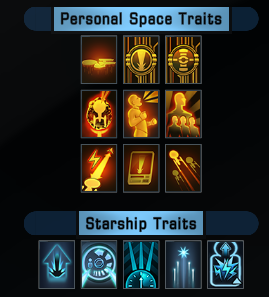 Whats the final starship trait on the split build? Changes coming to this build with the Discovery-release? Flying aroud with an exact copy now. 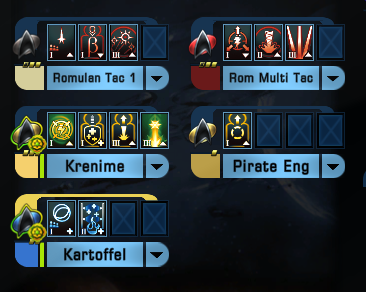 I have to admit, that I don’t have an updated build for this ship because the game changed to cannons. Anyway, if you use the first build I’d change the shield to the competitive (Innervated) and the deflector to a colony one (Intervention). 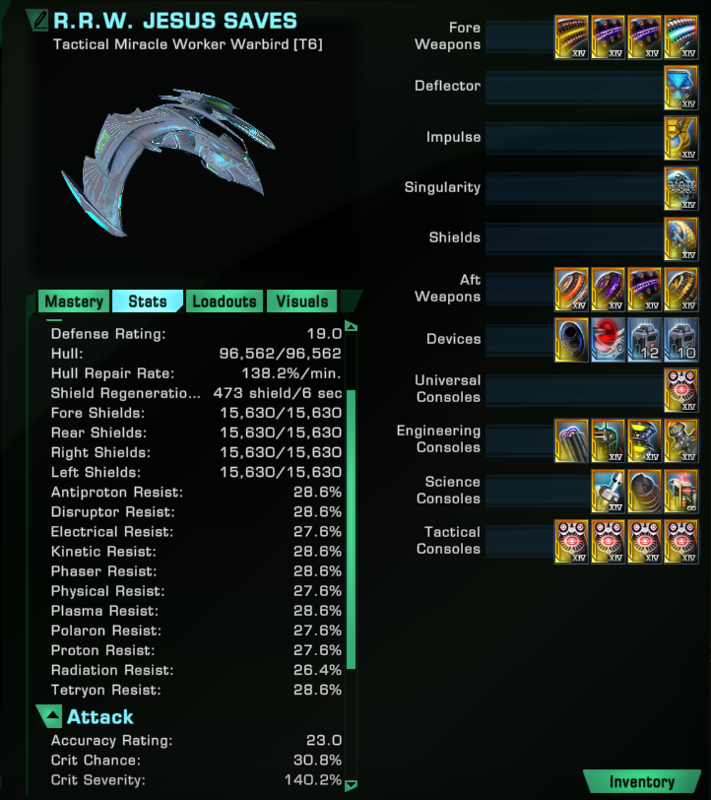 Weapons would be either full disruptor (Terran plus Spirals) or phaser (Terran plus sensor-linked and gamma-rep omni and consoles) and matching sets. No plasmonic, no KCB. I’d also consider using the engineering variant with Aux2Bat. I can tell that one is the House Martok and the other appears to be the Kinetic. But I don’t know the 3rd. Looks like Martok, Kinetic and the crafted. Martok, KCB and a crafted one. We only had crafted omnis back then. I’d use a sensor-linked omni now. Hi. On the consoles we lack Domino, Dynamic Power Redesyributor Module and Timeline Stabilizer. Do you have a recommendztion to replace those as it opens up 3 console slots? 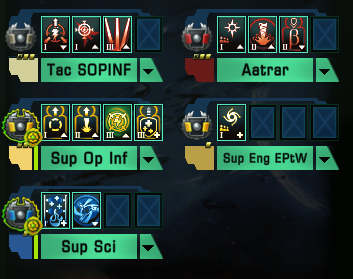 https://imgur.com/a/OuFzr9Y That’s just an example of a disruptor build with some ‘cheap’ reputation consoles. 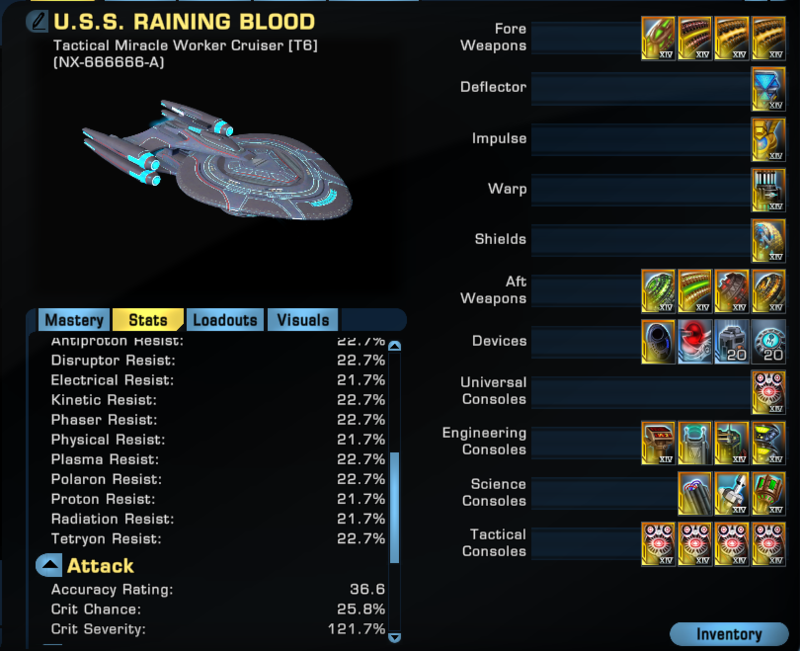 You should always look for consoles that add a basic damage boost, increase CrtH or CrtD or offer a great set bonus, like the CC-Set that adds +7,5% bonus damage to Phasers, Disruptors and Plasma. Or you throw in something that increases your survivability.